HAPPY HALLOWEEN! I hope you all are having a wonderful day! We have had a busy fun day. This morning we went to a party that had a ton of kids and it was so fun. Then at 3 we took Little Baby to his mom at work and went with them to another business that was giving out candy. Then we had trunk or treat at the church, where we gave out all of the candy we had, so we had to go buy some candy on the way home for trick or treaters. Both boys hadn't napped all day so they fell asleep in the van on the way home. Hubby should be home from his trip in about an hour, then we will eat dinner and he will take the boys trick or treating. It's been a fun day. What fun stuff did you do today? 5 Minutes for Mom is having a giveaway for an item from their store, Pedal Cars and Retro Collectibles. You could win a cool pedal car for your child, or choose from some other cool prizes. I know Toddler would love the Harry Car. And check out their store to see all the cool retro stuff they sale. I wanted to post an update on Little Ian and ask for some extra prayers for him. He has been on ECMO for a few weeks now, his lungs still can't work on their own, although his new heart is working well. They just found out today that he has a bleed in his head and they need to be able to take him off ECMO asap but his lungs won't tolerate it yet. They are going to try taking him off ECMO again tomorrow, please say some prayers that it will go well. That sounds lieka good enough list. We had to take our cat Colors to the vet this morning to get fixed and will pick him up later. I need to finish some laundry and it's about time to go switch the loads around. Oh, and I need to get lunch going too :) Hope you all have a great day! My head is pounding. My eyes don't want to stay open any longer. My nerves are shot. I could never make it as a single mom. Hubby left early this morning for a work trip to Las Vegas and he won't be back until Wednesday afternoon. I am already going insane. I seriously don't know how single moms or moms with husbands away for military or work can do it. I just do not have the patience for it. As soon as I can get Baby to go to sleep I'm heading to bed. The house is a mess and dishes and laundry need done, but right now I just don't care. I just want to crawl in bed and hopefully get a good night's rest. Check out Menu Plan Monday at Organizing Junkie to join in or get some great dinner ideas! Rocks in My Dryer is hosting another great giveaway with hundreds of bloggers joining in. Check out the Bloggy Giveaways site to see all the great giveaways and join in. 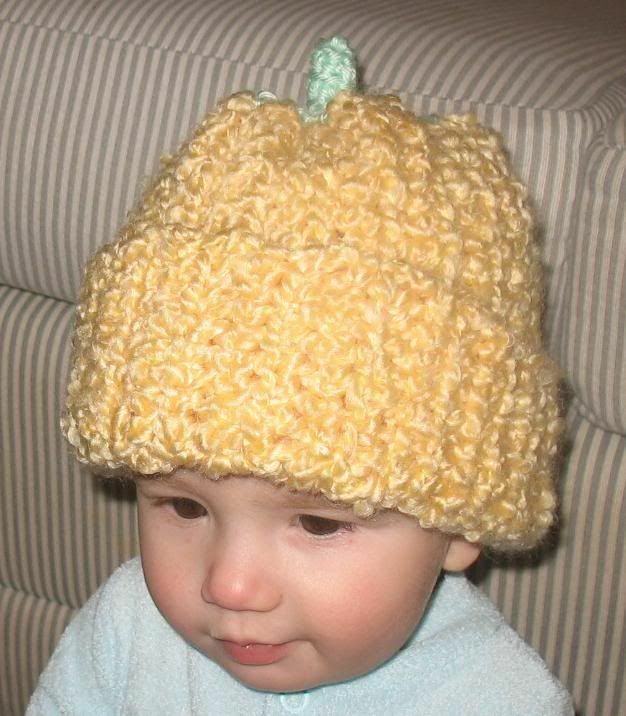 I am joining in too and giving away hats from my Kara's Custom Crochet site. You get to choose the type of hat, colors, and size (baby, toddler, child, adult). And I am going to be giving away 3! So go check out my site and then come back and leave a comment to enter. Contest open to USA and Canadian shipping addresses only. I will close it Friday night sometime. Open to non-bloggers also, just make sure to leave an email address for me to reach you. No duplicate comments please. For some reason I love getting the mail, it makes me happy to see stuff in our mailbox, as if somebody really cares about us lol. But these days you hear all kinds of stories about identity theft and how people can get information from your mail. I get nervous putting stuff to send out in our mailbox, cuz who's to keep somebody from coming by and stealing it? Sometimes I wish we had cbu mailboxes, the ones that lock so only the mailman and the owner can get into it. Of course I'm pretty sure I'd lose my key and never be able to get my mail lol. Of course I'm glad to have a mailbox at all. At our last apartment the mail came to our landlord's box that went into his garage so we had to wait until they were home and brought ours down to us. That was a pain when we were waiting for money or something that we needed asap, sometimes if they weren't home I'd have to sneak upstairs and get our mail. I'm so excited for Halloween. It's so fun to dress up the boys and take them trick or treating. Our church has a trunk or treat which is great for little kids. Of course I don't let the kids eat too much of the candy, I eat it myself lol. 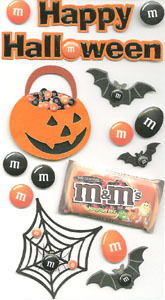 And we've stocked up on candy for trick or treaters too, and I'm sure we'll have extras. I'm going to need a drug rehab for over-dosing on sugar by the end of the week with all the candy I know I'm going to be eating lol. "Pride slays thanksgiving, but an humble mind is the soil out of which thanks naturally grow. A proud man is seldom a grateful man, for he never thinks he gets as much as he deserves." I constantly am thankful for the many blessings my family has, a good house, Hubby's good job, 2 healthy boys, etc etc. I do admit though that there are times I wish I had more, or feel like I deserve more, or something. It's those times I try to be extra thankful for the things I do have and remind myself that it could be much worse. Well, today we are going back to SLC to get the boys :) I miss my little guys, but it was nice to have a little break. We are leaving in a few hours and will be home some time tomorrow. I guess I should pack our bag, I still haven't. I have to go drop off Little Baby with his mom at work in about 30 minutes, and Hubby will be home by 12:30 then we are heading out. Hope everyone has a great weekend! Yesterday I posted about how a few of our kittens were sick and I had to take one to the vet. He said it might be distemper, which is basically a death sentence, but gave me some medicine and said he hoped it would help and maybe it was just a little bug. Well, there has been no more throwing up and the kitties are more active today so I think it's working :D Yay! I have to keep giving them the medicine for a few more days, and just keep an eye on them to see how they do, but to me it looks like it's not distemper. Name a great website you would recommend to others. On a scale of 1-10 (with 10 as highest), how often do you dream at night? - 9. I dream almost every night, but usually don't remember my dreams. Did you have a pet as a child? If so, what kind and what was its name? - My family always had dogs and cats. I remember having bunnies when I was little, and we had a horse once. The horse's name was Red, and I had a cat that was mine named Zen. If you had the chance to star in a commercial, what would you choose to advertise? What is your favorite kind of hard candy? Today I had to take one of our kittens to the vet. Last night one of them started throwing up and today another one was, so the vet told me to bring one in to see what the problem is. I was thinking just worms or something and he could give me medicine and it would be all better. Unfortunately he suggested that it may be distemper, which is not good at all and usually fatal, and very contagious among unvaccinated cats. I'm hoping it's not that and they just got some little sickness that will get better. The vet gave me some medicine to give the sick ones and said to watch if it seems to help or not. Poor kitties. Do NOT substitute olive oil for butter when making macaroni and cheese! Can I just say YUCK?! Ugh, it was so gross, I still can't get the taste out of my mouth. I realized halfway through making my mac n cheese that I was out of butter, so I tried to figure out what else I could use and figured olive oil would work. Um, no! Seriously, that taste was just not right. It doesn't help that I think the olive oil I have is past it's prime and tastes a bit, uh, off. Ew, I can still smell it too. I need to find something strong to eat to chase the taste and smell from my memory. Today I'm thankful for this quiet week I've had with the boys gone. But I miss them and their little hugs and kisses, which I am also thankful for. It's crazy how I can really want some time alone without them to get some rest and get the house clean, but still miss them a ton and want them back so I can cuddle them. One class I really enjoyed in college was a family finance class. My brother and I took it at the same time and it was an online course. The book we read for it was called "The Wealthy Barber" by David Chilton and was like a fictional story, but with financial advice given by a family friend who's a barber. It gave really good financial advice that was easy to understand. There was only one part I do not agree with. The author believes that you don't need life insurance for kids or anyone else who has no income. His reasoning is that if they die you are not losing income. But my view is that a person, even children, should have enough life insurance to at least cover the expenses of a funeral, which can be around $10,000. We don't have that kind of money just sitting around, so if we did have to pay for a funeral we would lose income. And life insurance really isn't that expensive usually. But besides that point, I really enjoyed that book and learned a lot from the class. For some reason last night I kept thinking that today was going to be Thursday. Not sure what I was thinking, but I am happy that it's only Wednesday lol. I didn't get anything on my to-do list done yesterday, except going to the post office. So today I need to work on the other stuff. I mostly want to get all the laundry folded and load the dishwasher. That shouldn't be too hard. I have 15 minutes until Little Baby gets here and that should be enough time to get the dishes done and the kitchen cleaned up a bit. Today's Heads or Tails theme is Train. Toddler loves trains. Every time we drive by a train he yells, "choo-choo!" and makes me sing a train song he learned at storytime. A few days ago I was telling Hubby that I figured out what we should get him for Christmas this year. I want to get him a Brio toy train set, cuz I've always thought they were so cute and I know he'd love it. Having a good day so far. The sun is shining and it's cold but not too bad. I got a short nap while Little Baby was sleeping and we just got back from the post office. It's so nice to be able to run errands with only 1 kid. Now I'm eating lunch and when Little Baby takes another nap soon I will take another one :) Oh, Dawn and Emily, expect your packages in about 4 days, sorry it took so long! So after my great weekend I just need to do some cleaning and relax. It is strangely quiet without the boys here and I get bored a lot easier. Little Baby is taking a nap so I really could just try to nap too. Weird. Actually I have one hat to finish crocheting so I can mail them off today. Should only take me an hour or two to get it done. I also need to fold laundry since I never got that done before we left last week. And I might watch some movies I DVR'd last week while I crochet, since I don't need to watch cartoons all day lol. I hope my boys are having a good time with my family. I can't believe Halloween is almost here. Before you know it Thanksgiving and then Christmas will be here. Of course stores are already displaying Christmas stuff. I don't know why WalMart insists on starting Christmas 3 months before everyone else. The whole north end of our store is dedicated to holidays this time of year. You walk past the aisles of fattening Halloween candy that they purposely place right across from the health section with it's selection of Slim Fast and diet patch display, then you head into the land of autumn-colored place mats and plastic cornucopias that they have on display for Thanksgiving, and into the winter wonderland that is set up for Christmas, complete with trees, singing elves, and toy trains running through the little villages. By the time Christmas actually comes I'm sick and tired of seeing all the decorations and that cinnamon smell they coat everything with gets so annoying. I try to avoid it as much as possible so that I don't get Christmas-ed out too early lol. In the area where my family lives, the housing market is just going nuts. in the last 5 years home values have at least doubled. It would cost us twice as much for a house down their that compares to ours here. I'm not sure how we could ever aford a house if we ever move down there. It's not as expensive as places like New York or Arizona luxury real estate, but still a bit high. It's so crazy how fast that area is growing, someone told me it's one of the fastest growing areas in the country actually. Every time we go visit there is a new shopping center or housing development. And they are all really nice too. One thing I don't like is the housing developments are all the same basic house design with no yard. I like having a yard for the boys to play in and it's getting hard to find new houses there that have a big yard. "We cannot think first and act afterward. From the moment of birth we are immersed in action, and can only fitfully guide it by taking thought." For some odd reason this quote reminded me of an experience I had this weekend. I went to dinner with my sister and sister-in-law and we went to TGI Friday. We were talking and laughing and not paying attention. We walked past a couple guys leaving the restaurant and one said, "Oh, *dang*. Hello ladies!" in an admiring tone. It took us completely off guard and we just burst out laughing. It was soooo funny :D Anyway, I like this quote and I'm sure it can tie in with that story somehow, but I didn't sleep well this weekend so my brain stopped working about 2 hours ago and I'm heading to bed. If you can make a correlation, feel free. :D Good night! Somy little sister just finished coloring and cutting my hair. It's been over a year since I've had it done so it was long past due. It's red and she just trimmed it a bit and added some layers. I love having red hair :D I also love having hairdressers in the family to do my hair for cheap! My sister-in-law gave the boys and Hubby haircuts today too. Now we all look much better. I will try to get a picture up when we come home tomorrow. Well, it's time for me to turn off the computer and finish getting ready to go. Not sure if I'll be on much this weekend while I'm at my family's house. I'll be having to much fun. My little sister is going to do my hair, I'm going to some Halloween thing with her and my sister-in-law tomorrow night, and church with the family on Sunday. Should keep us busy. We'll be back Sunday night, without the boys. I hope everyone has a great weekend! Well, I am half packed for our trip to SLC tonight. Just waiting for some laundry to get finished. I need to make a list so I don't forget something, though I'm sure I will anyway lol. I always forget something whenever we travel. The boys are being good so far, Little Baby is napping but should wake up soon. I think I'll go get the living room vacuumed while he's still asleep, it needs it so bad. 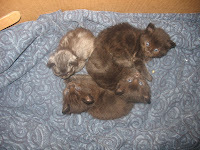 Oh, and I need to get some new pics of the kittens up later. They are 3.5 weeks old and so cute! If you were a dog, what breed would you be, and why? What does the color purple make you think of? Approximately how long does it take you to get ready each morning? - If I need to shower, about 30 mins. If not, 5 minutes. How many cousins do you have, and are you close to them? - LOL I'm not even going to try to guess, but it's in the hundreds, seriously, and not close to most of them. My boys loving taking pictures. They will climb up on the desk and get the camera and just start snapping pictures. Toddler actually does a pretty good job. His objects are nice and centered and look pretty good, besides the fact that they are ordinary objects like a chair, the window, a toy. He also likes standing in front of the mirror and taking a pic of himself, so when I go through the pics on my camera all I see is a flash with legs. And Baby learned how to turn the camera on recently so he will sit on the desk taking pictures of himself up close saying "Teez!" or his legs or close ups of the desk. He just loves getting his picture taken too. Any time I get the camera out for anything he has to come stand right in front of it with his face as close as possible and say cheese :) My boys are so adorable! Today is nice and sunny. It's still freezing cold, but at least the sun is shining. I'm sure that is part of the reason I'm in a better mood today. Yesterday it was all overcast and gloomy, which makes me feel yucky. But when the sun is shining it makes everything look better. I could never live somewhere that is dark half the year, I would go insane, I need light. :) I definitely have more energy today and feel happier. So looks like it will be a good day. OK, I have a bunch of stuff I need to do before we leave to SLC tomorrow. I need to clean- vacuum, dishes, laundry, playroom. And once the laundry is done I need to get us all packed. I usually end up doing it last minute and I don't want to do that this time. I better go get started while Little Baby is sleeping. I don't know how people managed before microwave ovens were invented. Seriously! How would I cook anything without my microwave? Like popcorn and hot dogs and hot pockets. And how would I easily reheat leftovers? I really can't imagine using my stove/oven for all that, that would take a lot more time. I'm not sure I'd ever have time to eat if we didn't have a microwave lol. And I really love ours because it's huge. It's probably 25 years old and still runs great. It's very large so it fits anything. I could probably fit a whole turkey in there, though it probably wouldn't cook very well lol. The only problem is that the lining around the door is cracking and breaking and I'm not sure if there would be replacement parts for it since it's so old. I guess we could call the manufacturer and see. We really don't want to get a new cheap model that won't last as long or hold as much. Ours is the best. Little kids are so much easier to Christmas shop for. As long as they get something colorful that makes noise they are happy. But shopping for teenagers and young adults is so much harder. They want stuff like cell phones. Van Halen tickets, video games, expensive clothes, etc. I never know what to buy anyone anymore since all my brothers and sisters are growing up and I don't know what they like that I can afford lol. I might just have to see what movies they like and get those for them. People like movies right? Buying for couples is even harder too. Any ideas? Today I am thankful that I'm in a better mood today :) Hopefully it will stay that way. And I am thankful for my cute new phone. And I am thankful that we are going to see my family this weekend. Hubby and I will stay a few days, and the boys will stay a week. That will be really great. Plus my little sis is going to cut and color my hair, it needs it so bad! I'm thankful for a sister and sister-in-law who do hair, they do a great job. Have you ever had one of those days that you are just in a bad mood and everything gets on your nerves? I am having one of those days. I don't want to be around anyone cuz everyone annoys me, even if they haven't done anything. And I annoy myself. And every little thing the boys do is driving me insane. Like right now one of the boys pushed the page button on the phone base so the phone is beeping repeatedly and I just want to throw it out the window. I better go stop it, cuz it means that one of the kids is on the desk downstairs and might push the modem button and cut me off here lol. We had preschool today and that was good, the kids seem to enjoy it. I need to do a little cleaning today, but not feeling like it right now. Maybe when Hubby gets home. Oh, and I need to get dinner started in about an hour. Today's Heads or Tails theme is 10 Things. We get to list 10 things in any category we choose. Head over to Skittles' Place to join in Heads or Tails Tuesday! Today has been so nice and slow, but the time went fast. Weird. The boys all napped at the same time, I got dishes mostly done, the house isn't too messy. All together it's been a pretty good day, especially for a Monday. Now we are getting ready to go out to Pizza Hut for dinner. Mmm, pizza. I really like having a good normal day with no big messes or anything, Toddler didn't even get a single time out or "Stop that!" the whole day :D Hope everyone else had a good day! My throat still really hurts. The cool dry air at night makes it so bad. I guess I need to pull out my humidifier and see if it still works. Don't have much to do today except work on crocheting some hats and get them mailed off it I can finish them today. Already did a load of dishes, about to go put a load of laundry in the wash, and I should clean bathrooms, but that's about it for today. I'm just going to focus on keeping the house from being trashed since Hubby put so much work into helping clean this weekend. Anyone doing anything fun today or this week? A friend of mine from a messageboard recently won a huge home entertainment system. Well, her husband did actually. Anyway, it came with a huge 90" projection screen, surround sound, and all new things like DVD, VCR, satellite, etc. It sounds so awesome! I think the only thing missing is some home theater chairs. It would be so cool to have something like that and have friends come over to watch football, or movies, or play video games. I mean, a 90" TV, how cool would that be?! That would take up a whole wall! I bet the Superbowl would be so much fun, to have a huge party and watch on that big screen! You know what's silly? I hardly ever wear jewelry except my wedding and CTR rings, but I have plenty sitting around my bedroom. I have some pretty necklaces and earrings and bracelets that just never get worn. I really like cute earrings, but I think I stopped wearing them when I had Toddler cuz I was afraid they'd get ripped out of my ears. And I'd be afraid to wear them when I have Little Baby over cuz he just loves to grab things with his tiny little strong fists, so I know he'd pull them. I guess my jewelry wearing days will have to wait until I have no babies in the house lol. Friendship is born at the moment when one person says to another "What! You too? I thought that no one but myself." Very true saying. I think most friendships start with finding someone you have something in common with. It would be hard to stay friends with someone if you don't agree about anything. Unless of course you both loved to debate, then I guess that could be fun lol. It's so nice to have someone you can talk to about things that interest you and them. Ugh, I think I'm getting a cold. I woke up with a very scratchy throat and it still hurts. Now my nose is starting to feel stuffy and I have a headache. Plus I'm tired and I pulled a muscle in my rear end so it hurts to walk. I really should try to get a nap, but Toddler is playing with a friend and I will have to wait until he naps. My Hubby is the best. On the weekends he always helps get the house cleaned. And he does a good job too, even better than me. AND I don't even have to ask! It is so nice to start off a new week with a clean house. :) Aren't I the luckiest woman on Earth? Well, still not doing too well. I think this week I'm just going to focus on a few and not worry about the rest. I'm going to focus on reading my scriptures and saying my prayers, because I know when I do those I am in a much better mood, and hopefully being in a happy mood will help the rest just come naturally. I'm always on the lookout for good books to read. I really like fantasy/sci-fi stuff like Anne McCaffrey, Orson Scott Card, and stuff with dragons and stuff lol. I also like action like Clive Cussler and religious fiction like Gerald Lund. Anyway, I'm pretty diverse in what I like. My sister recommended I read the Twilight series by Stephenie Something-or-other, anybody read that? Is it good? I have it on hold at the library but they are all checked out and I'm like 25 in line for them, guess that means they are good lol. But I need something else to read until I can get them. What are some of your recommendations? I have always wanted a personalized locket so when I got the chance to get an engraved locket from Picturesongold.com I was soooo excited! They do engraved gold lockets and other jewelry. I chose to get mine on silver since I like that better than gold and my rings are silver and white gold. Then I chose a color picture of my Hubby and I from our wedding day, one of my favorite pictures from that day. I also got a little saying engraved into the back. It is the same thing I had engraved on the inside of Hubby's wedding band: "Today, Tomorrow, Forever" and had our wedding date engraved under that. When Hubby brought in the mail today and gave me the package I was so happy. I ripped it open and it was even better than I'd imagined. It really is beautiful. The picture looks great and the engraving is perfect. I'm thinking that now I know what to get a few people for Christmas! And they don't do just lockets. They also have charm bracelets, name jewelry, locket watches, and tons more. I am so happy to have my beautiful locket and would definitely use PicturesOnGold again. Um, yeah, I can't think of any. After a few rounds they all get old, though there are some hymns I don't mind hearing frequently. Ok, seriously, I think everyone I know has already been tagged for this, so I have no idea who is left to tag. So um, tag, you're it! When was the last time you were surprised? - When I went downstairs the other day and saw the huge mess the boys had made. Fill in the blanks: My eyes are ________, but I wish they were __________. - My eyes are uneven, but I wish they were perfect. If you were a Beanie Baby, what would you look like and what would your name be? Name two things you consistently do that you consider to be healthy habits. What brand of toothpaste are you using these days? Do you like it? Why or why not? - I can't even remember, whatever I have lying around, Crest or Colgate or something. Oh, I just remembered what I was going to post! I have a meme that 2-3 people have tagged me for but I don't have time to do it right now cuz ER starts in about 5 minutes and I need to get downstairs before Hubby tries to change the channel lol. :D Love that show! Wow, today seemed to drag on so long. And I just remembered I still need to finish some laundry and do dishes. Fun times :) My gums and teeth are sore from my dentist and orthodontist appointments so it hurts to chew, but it's a good way to get me to drink more water lol. I keep thinking there was something I've been meaning to post but I can't remember what. I was hoping that if I started typing it would come to me but no such luck. I really should keep a notepad for that type of stuff so I don't forget. Kids these days don't go outside enough. TV and video games have taken over playtime. Whatever happened to hopscotch, jump rope, and model rockets? I remember when I was little we'd all go play outside with our cousins and friends, riding bikes and playing "Kick the Can". It was such a blast. My Toddler loves to play outside with his little friend from next door, even when it's only 50 degrees outside. I'm so glad we have a big backyard now that he can play in, it'll be so fun next summer to let the boys run around out there and work off some energy. And now that we have grass planted they won't be all covered in dirt after playing lol. I'm thankful that I got to spend a great weekend with my mom, aunt, and sisters. It was so fun! And I'm thankful that my teeth are nice and clean, even though I don't like going to the dentist it's worth it. And I am thankful Hubby is working from home today and has tomorrow off, it's a relief to have more than one adult in the house. I swear it feels like it should be at least Thursday by now, this week is going too slow! My teeth hurt :( I really hate the first few days after an orthodontist appointment. My teeth just ache and are sore. Stupid braces. I didn't even get anything done that I wanted to today. I wanted to make bread and get the laundry done, but forgot until too late. Maybe tomorrow. Hubby is working from home tomorrow and took Friday off so I'll have a little help. We both have dentist appointments for cleanings tomorrow too. I don't particularly like going to the dentist, but I love the feeling of nice clean teeth. I swear it feels like I go to the orthodontist an awful lot. I have an appointment today but it doesn't even feel like it's actually been a month since my last appointment. The months are going by so quickly, yet it still feels like I've had my braces forever lol. I'm tempted to tell them that my teeth look good enough to me and I want them off now lol, especially when there are people that tell me they wore braces for 4-5 years and I've only had mine 2. I don't think I could stand another 2-3 years! By now all my regular readers should know that I love being able to make money on my blog. Well, yesterday I was just reading through my feeds and saw a few bloggers who had joined Bloggerwave. It is a new company where you get paid to post reviews, opinions, and buzz about products or sites. And it was so easy and quick to get started. I signed up yesterday and am already approved, less than 24hrs later. Go check it out! Head over to Rocks in my Dryer for lots of helpful tips. 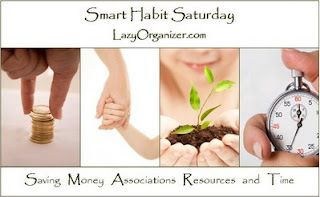 My tip today is one I read somewhere else, probably on Organizing Junkie or Lazy Organizer. 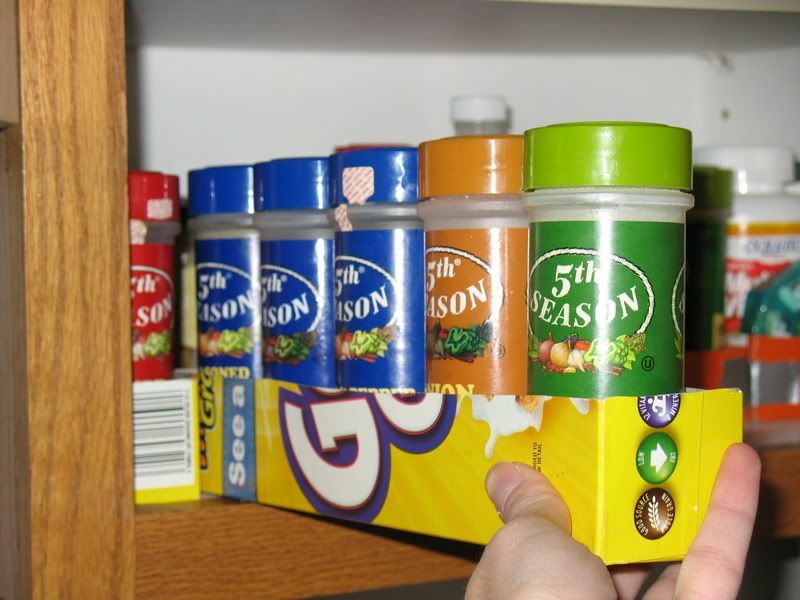 The tip is to use empty cereal boxes and other boxes as cheap storage containers. What I do is I cut the box down to the height I need it and it makes an easy box. 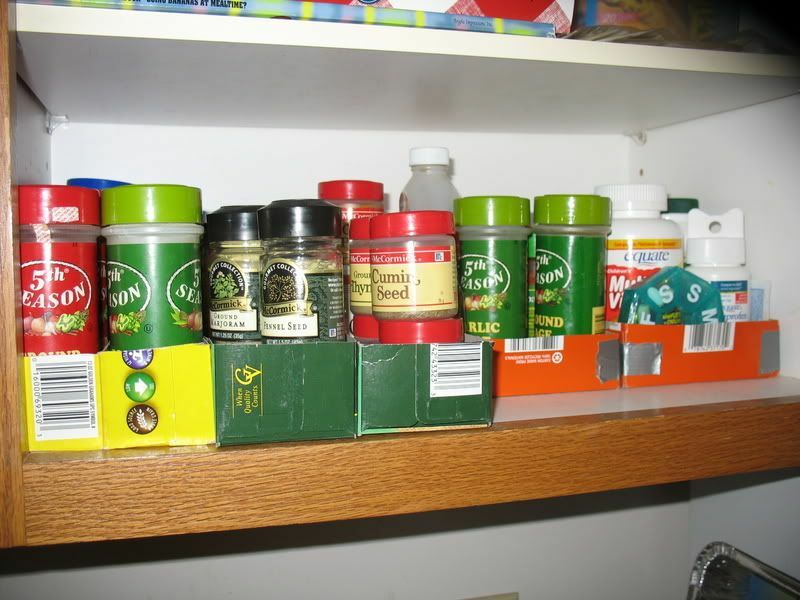 I use the ends of cereal boxes to keep my spice cupboard organized, and I have all my most used spices in one so I can easily pull out that one box while cooking and have my spices where I need them. 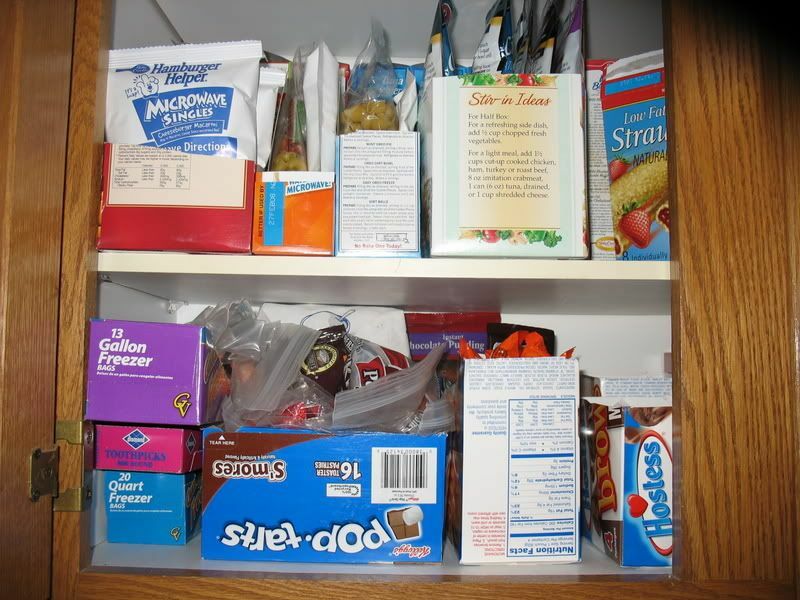 I use other empty food boxes in my pantry to keep bagged things organized. I also have different sizes of boxes in my junk drawer to keep it slightly more organized. And cereal boxes make good magazine holders. Today's Heads or Tails theme is Explore. You know, the only thing I could think of that had to do with exploring was yesterday's Columbus Day holiday. In 1492, Columbus went exploring and found what he thought was India but was actually America. Or that's about all I can remember of the story lol. He was much cooler in elementary school when we got to spend the day making paper hats and coloring pictures of the world and boats. Personally, I think there are cooler explorers like Magellan. He sailed around the world, but we don't get to have a Magellan Day, instead we get an almost non-holiday for a guy who bumped into the wrong continent and got all the natives mis-named forever. I guess I wouldn't mind as much if the almost-holiday wasn't responsible for closing the banks, libraries, and post offices on what is a normal day for everyone else. Or if we got candy or presents or flowers or something for the day. We have preschool in an hour and I haven't even looked at our Month 2 curriculum yet. Better at least go skim through it. And I have to get laundry done today or I will have nothing to wear. I am not in a good mood this morning. I did not get enough sleep all weekend. I don't watch Little Baby this morning so I was going to try to sleep a bit longer, but Hubby is way too loud in the mornings and woke the boys up. Sigh. Anyway, when I don't get enough sleep I tend to be really grumpy and have less patience. Hopefully I can get the boys to nap good today so I can get a bit more sleep and hopefully that will help my mood. I forgot to mention the snow we got this weekend! I was away in Bear Lake, where it snowed about 5 minutes, but while I was gone they got a few inches of snow here at home! And it was heavy, wet snow too and actually make 3 big tree branches break off the big tree behind our house and a bunch of other branches are bent way down. I am not at all happy that winter is trying to make an early appearance. I hate the cold! We've had to turn off the window a/c units and ceiling fans, and now we have the heaters turned on :( Why can't we just go straight from Autumn to Spring? Who needs winter?! On Friday when I was driving down to my girls weekend away thing it was windy, rainy, and dark. I absolutely hate driving in the dark, but adding in the wind and rain made it a million times worse. I don't have the best night vision and get nervous. I'm surprised I didn't get in a semi truck accident because every time a semi drove by the wind would knock the car around a bit and make me flinch. Luckily I drove back during the day yesterday, although I was tired and almost fell asleep driving and the sun was very bright and hurting my eyes. I just really hate to drive, and would've made Hubby do it if he'd been allowed to come lol. I really need some new shirts. I only have maybe 6 and they are starting to get faded and worn. I really like the shirts from Down East Basics since they are extra long and comfortable. I don't usually buy clothes from WalMart anymore cuz they tend to wear out sooner. I've looked a bit at JC Penney, Sears, port authority clothing, and ShopKo. I think I should go check out Ross, my mom and sisters keep telling me they have cute cheap clothes but I forget to go see for myself. Hey everyone, I've made my comments Do Follow which means that comments you make here are followed by Google and count as a link for you, which is good :D Check out Randa Clay for more info. I had a wonderful weekend with my mom, sisters, and aunt. It was so nice to just have us ladies together to hang out and talk. Mostly we just talked, we played some games, watched some TV, and went to the pool a few times. I taught one of my sisters how to crochet and it was so fun to get to talk to her since we used to talk so much before I got married and moved away. Hopefully we can do this more, it was such a great weekend. Since I'm going to be gone for 2 days I figured I better post this today. I've been doing pretty good at my most recent goal to drink 4 cups of water a day, and I've done good with a few others but I'm still slacking on my cleaning goals and my nightly routines. But oddly I don't feel much remorse about it this week lol. So I'll just keep plugging away at it and maybe one day they'll start coming naturally. I'm so excited for this weekend! No kids, no Hubby, just me and the ladies in my family hanging out for the weekend! I might have time to finish crocheting the blanket I'm working on, I won't have to clean up after anyone but myself, and I won't have to even worry about my house getting trashed while I'm gone since the boys are spending the weekend with Hubby's family. YAY! What is one word you don’t like the sound, spelling, or meaning of? - I can't think of any right now, but I bet it would start with a "G"
Do you wear sunglasses when you’re outside? If so, what does your current pair look like? -Nope, I can never find a cheap pair that look good on me. I have a pair lost somewhere that I never wear. - That would depend on what the book is about but it would definitely be a family member. Name a beverage that you enjoy. - Egg nog. I got so excited when Hubby brought some home the other day, I love when it's finally here for the season and sad when they stop selling it after the holidays. 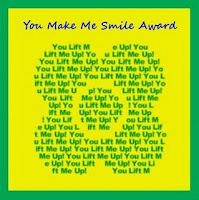 I've received a few more blog awards that I better post about before I forget again. Congrats Melissa! I'll be contacting you shortly. Thanks again to everyone who entered! I think I may do another giveaway around Christmas so be on the lookout! Today WFMW has done a flip and it's time for us to ask for tips instead of giving them! I kept forgetting what I wanted to ask by I just remembered so I better post before I forget again! I was recently given some eggplant and long green peppers (can't remember what they are called) and have no idea what to do with them. I've never used either and feel bad just letting them go bad. So what are some easy eggplant recipes and what the heck do I do with a bunch of peppers? Head over to Rocks in My Dryer to get your questions answered! I posted yesterday about a friend's little boy Ian getting a heart transplant. They just posted an update today on how it went. The procedure was long and they had some rough spots with bleeding and him going into cardiac arrest a few times, and they had to reinsert the ECMO to give his lungs a rest, but now he is stable. He is on immunosupressents to keep his body from rejecting the new heart but it is working good and hopefully in a few days he will be off ECMO and recovering well. Please continue to keep them in your thoughts/prayers for a good recovery. This poor little guy is less than a year old and already undergone so many treatments and surgeries. I'm a hopeless romantic at heart, cheesy love stories and chick flicks make me so lovey dovey. My Hubby can be pretty romantic too when he wants. He used to always surprise me with flowers and chocolates for no reason. Here's one particularly sweet thing he did for me that made me love him so much. We were both still in college, living in a nice little basement apartment. 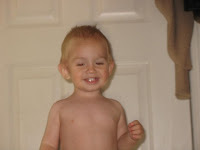 Toddler was a little over a year old and I was pregnant with Baby. On top of being a mom and part time student, I was also working a full-time graveyard shift while pregnant. For about 2 months I lived on about 2hrs of sleep a day since the time I was at home I was watching Toddler while Hubby worked full time and went to school full time. It was rough, I had to be on my feet all night and lifting things a lot. I'd come home completely exhausted with about an hour to eat breakfast and get ready for school. Normally Hubby would still be asleep when I got home. One morning I cam home and hubby had made me a delicious breakfast and had the table all set with candles and roses. It was so wonderful and sweet and I will never forget it. Now it's a bit harder for us to find time to be romantic with two little kids and work and everything, but for those of you like me we can still find romance by getting lost in good Romance Novels. I love to read and a good romance is great for helping me feel romantic in my own relationship. www.millsandboon.co.uk offers a wide variety of romance novels for you to get lost in. Today's Heads or Tails theme is Stack. A few weeks ago I posted about a friends baby boy Ian who has heart problems and was in the hospital. A week ago he had heart surgery but his heart was not functioning by itself and he is on ECMO and they have been waiting for a new heart for him. Today they got news that there is a heart for him and he will be having heart transplant surgery today! They are very hopeful that this is going to make such a difference for him. Please keep him in your thoughts and prayers today. Also, there is a family somewhere grieving the loss of their little one but they were generous enough to donate this heart, so please keep them in your prayers too. Today is preschool day but Toddler has a cold so we probably won't go, I'll just go over the stuff with him at home. And I don't think I want to drag the boys into the store so I think I'll have Hubby pick up stuff on his way home. If the boys are really good I can work on the blanket I'm making for the winner of my contest. By the way, the winner has not contacted me yet, so if I don't hear from her by tonight then tomorrow I will be drawing a new winner for the blanket and post it. 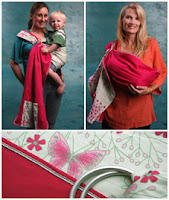 I know a lady from a messageboard who does some awesome embroidered products. They are so adorable and she really does an amazing job. I really want to get some "Big brother" "Little brother" shirts for my boys. Go check out her site Little Lamb Embroidery, I promise you will love her stuff! She does clothes, blankets, backacks, and tons more stuff and it is all sooooo cute! So I haven't worn glasses for probably 10 years, ever since I got contacts. I finally got a pair to use as a backup. I tried on about 50 frames before finding the perfect ones, waited a week to get them and finally got them Saturday. This morning I decided to try them out. Unfortunately they did not work like I expected. I couldn't see straight so they made me dizzy and gave me a major headache. I ended up taking them off after only an hour and putting in my contact, but the headache has stuck around all day. I think the prescription for the right lens is wrong, I see worse in that eye with the glasses on, plus I don't wear a contact in my right eye normally (I have a scar on it) so it's not used to having any correction. I'm thinking I'll need to make another eye appointment and see if they can figure out what to do. I might just tell him I want a lens with no prescription for the right since I don't normally have one. Wow, I can't believe it is October already! Though the SNOW we got on Saturday made it feel more like December! Stupid snow :P Anyway, today I am trying to get some cleaning done. I just finished loading and unloading the dishwasher. Baby and Little Baby are napping and Toddler is playing with a friend next door. If he comes back anytime soon I'll put him down for a nap too and maybe get a chance to lay down for a bit myself. I need to go to the library today to pick up some books on hold before my hold expires, don't let me forget! I also need to do a few loads of laundry, but it can wait for later. Last year in March Hubby and I drove to San Diego. I love San Diego, the weather is always so nice, but a 14 hour drive when you are 34 weeks pregnant is not my idea of fun lol. Not to mention the snow storm we drove in through most of Utah. On the way back we decided to spend the night in Las Vegas so we wouldn't arrive at my family's house at 3am. It would've been nice to stay somewhere like the Excaliber or the Sahara hotel but for one, I was pregnant and the smoke was making me sick, and two the prices were outrageous. So we ended up driving all over to find a Holiday Inn Express. All together it was a great trip, but next time I travel pregnant I would prefer to fly!